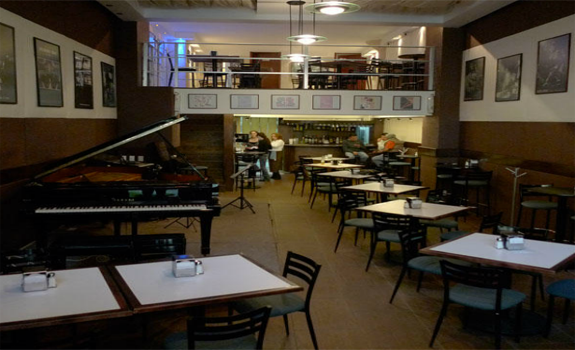 Food and jazz delights, live music free of charge, delicious meal and excellent atmosphere…where? Only at Mexico City’s Blue Monk Jazz Bistro! Imagine a place where you could stop by for lunch, take a break from work, enjoy a good menu while experiencing some hot live jazz, completely for free… You might think that we are dreaming or talking about imaginary places… Well, if that is what you have been thinking, then you are completely wrong. What we have just described is the philosophy of the Blue Monk Jazz Bistro. Located in Mexico City and named after the legendary Thelonious Monk, Blue Monk is all about music. Originally opened in 2003 under the name PapaBeto, the venue was the centre of the Mexican jazz scene for 7 years. During that time many musicians stopped by to perform. From emerging locals, looking for a breakthrough, to big names like Wynton Marsalis, Makoto Ozone, Eddie Gomez and Clarence Penn…every performance has been a celebration! PapaBeto officially closed in March 2010, but its team was eager to keep on spreading its love for jazz in Mexico City’s day and nightlife. Blue Monk opened its swinging doors in 2011, in a new space, and has been successful ever since. At the base of its fame there is the high-quality food: starters (make sure to taste the Jamón Serrano Marinado al Limón), a good selection of soups, salads, meat, pasta and delicious desserts. From Monday to Friday, from 1.30pm to 11pm, every moment is perfect to visit Blue Monk and taste one of the chef’s delights. At lunchtime, starting from 2.30 pm, there is the chance to listen to some live music, completely for free! That’s right, no fee at all. What better way to take a break from work than having relaxing tunes accompanying your meal? On Fridays and Saturdays Blue Monk hosts its jazz nights: 360° jazz shows and jam sessions in a friendly atmosphere. Very well-known among locals and loved by tourists, Blue Monk Jazz Bistro is the place to be if you wish to take a break from a hard working day – or vacation under the hot sun – with fine live music, food and ice-cold drinks. Blue Monk will take your thirst away, will make you fall in love with its exquisite menus and it will put you in a party mood with exciting live performances.